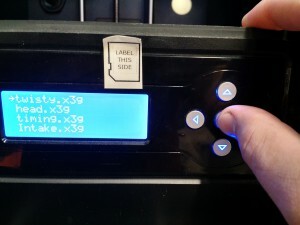 This is intended to be general purpose guide to the FlashForge Creator Pro 3D printers in The Construct, so always remember to seek out help from a lab manager if you are unsure or have questions. Read ALL parts of this tutorial before starting your print! Step 0: Should I print this? Take a look at these considerations to answer this. If you’re confident that 3D printing is the way to go, then carry on! How you go about doing this will vary depending on what type of part you are making. Any software will do as long as it can export to the .STL format. Please see our Designing for 3D printing page to determine what sort of software is the best type to use, and how to design your part to print well. Along with that, you can use an online model sharing site like Thingiverse to locate and download a model. In order to get your files into a printable form, they must be exported from the modeling software in .STL or .obj. STL files do not encode units, so in order to make the part print at the correct scale, export from your CAD software in millimeters (mm). Open the profile of Cura you have chosen to use from the computer’s desktop. Click the load model from file button, and browse for your part. When the part loads, it may not be in the orientation you desired, though it should be the correct scale if you exported it correctly. 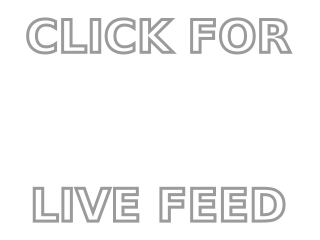 Click on the part, and Use the scale button to adjust this if necessary. You can use the output dimensions to scale your part to match the size you expected. Left-click and drag the object to move it around in the print bed. Use the rotate button to orient your part so that it fits in the print area, and so that support is minimized. A good general rule of thumb is to make your part a Pyramid: put the widest flat face at the bottom, and have the smallest region pointing up. Also factor in the orientation of the layers, and the fact that a low, flat print will be faster than a tall, skinny print. Once your orientation is set, Cura will pre-slice your part. Wait for this to finish, take note of the print time and weight of material in the upper left. You also can click the print preview button to see the print with support and raft generated. Use this opportunity to check it for any unexpected support regions and as a last sanity check before printing. SD card goes in with the label out. it only sticks in halfway, so Don’t try to push it in further! Cura will now allow you to save the file to the SD card, by clicking the save button . Cura will do its thing, and will then open a black window for post-processing. Wait for this window to close before doing anything else! This is GPX, an application that converts the .gcode file that Cura makes to an .x3g file for the printer. If you remove the SD card early, the program won’t finish converting and you’ll end up with an incomplete print. Before continuing, Fill out The Construct 3D Printing Form (will appear on Cura once you save). This log allows us to gauge the printers’ usage level and filament consumption, so it is mandatory for every print job run. Make sure to include your file’s name and the weight that Cura reports. 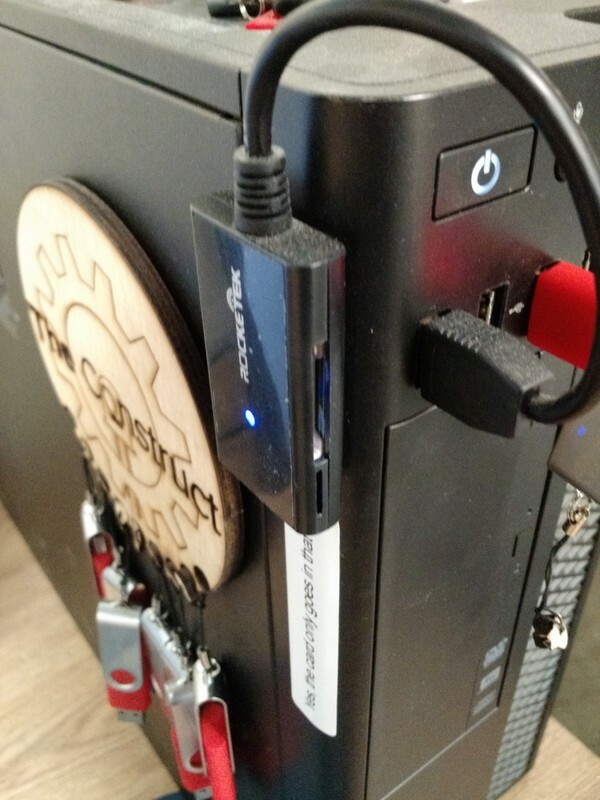 Click the eject button in Cura, then take the SD card out of the computer and plug it into the printer. The pins of the card face down and into the machine so that the label of the card faces you. Do not force the card into the slot! If it does not go in, re-align and try again. Ensure that the surface on the bed is flat, smooth, not ripped, and free of any material. Check the filament spool and make sure there is enough filament to produce your part. If the printer does not have sufficient plastic, speak to a lab manager. Do not attempt to change rolls yourself. 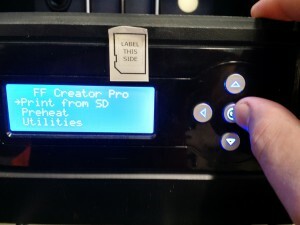 On the printer, press the left button to return to the main menu, then select “Print from SD.” Navigate to your part file (usually at the bottom of the list) and select it to begin the print. The printer will home, heat, and print the part automatically. Please observe the printer until it has printed several layers (~10 min), as most print failures happen within the first 10 layers. 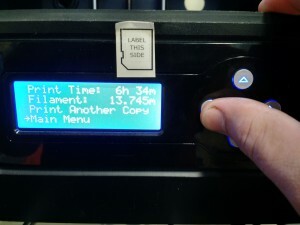 Once it appears to be printing well, it may be left alone to complete. The bed will drop to the bottom once the print is finished. Construct staff will not restart prints that fail due to user error. It is your responsibility to follow all of the above steps and make sure your prints run as they should. To remove the part, carefully insert the round-edged scraper underneath the part and slide in. Gently apply force to one side of the part until it separates. If you are worried about damaging the printer or the part, ask a lab manager for help. As always, if anything is unclear or you have further questions, ask someone experienced with 3D printing in the lab.